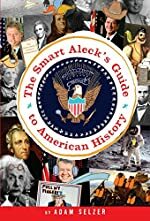 Review: The Smart Aleck's Guide to American History written by Adam Selzer is a very funny but factual book. The book has factual information about American History like what I learn in school but it is more fun to read than a normal history book. Before I knew what this book was about, I thought,”Nonfiction? Boring!” But this book changed the way I view nonfiction books. There are eleven chapters in this book. The first chapter starts with early settlers to America. It includes what the historians thought happened before Christopher Columbus "discovered" America. The rest of the book takes the reader throughout history: the Revolutionary war, the late 1700's - early 1800's,the Civil War, the 1900's including the industrial revolution, WWI, the roaring 20's, the Great Depression, WWII, 1947-1989 which included the space race, a change in pop culture, and the civil rights movement. The book concludes on a chapter of recent events such as 9/11, the war in Iraq and Afghanistan, and the election of Barack Obama. You can learn all of this from the internet, text books, and class lectures but what makes this book unique is the funny parts in it which were written or pictured in each chapter. For example there are pictures with captions that are funny because they depict history in an unexpected way. In the chapter about the late 1700's and early 1800's there was a humorous “try at home” experiment about flushing corn down a toilet because John Quincy Adams liked corn and was the first president to have a toilet in the White House. All history books have review questions at the end to help you review the chapter this book has a review about silly facts or jokes in the chapter. I thought this book was great. I would recommend this to sixth graders and older. I say this because a lot of the jokes you have to know a little bit more about history than a child younger than 6th grade would know. An example is when it kind of makes fun of Christopher Columbus and how he knew the world was round. I give this book four out of five stars because it was funny and informational. Something I did not like about the book was the book did not tell all of the background to the jokes, which made the book confusing at times. This however could be an example of why the reader needs to have solid background knowledge before reading the book. Also there were some failed attempts at jokes within the book like the pickle jokes. However if this book were my history book I would want to do my history reading every day! We would like to thank Random House for providing a copy of The Smart Aleck's Guide to American History for this review. Have you read The Smart Aleck's Guide to American History? How would you rate it?